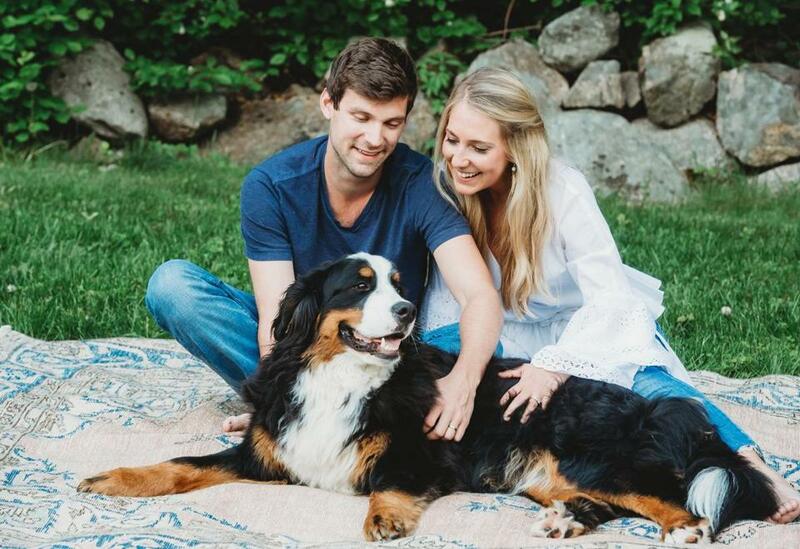 Lindsey and Josh Graziano, creators and owners of New England Loom, sell vintage rugs online with some help from their dog, Mowgli. When Lindsey Graziano told her husband Josh that she wanted to take $5,000 from their savings to buy rugs, he thought it could be an interior decorating boondoggle. “I thought we’d just own $5,000 worth of rugs,” he laughed. But Lindsey was acting on intuition and savvy. She had sourced 10 vintage kilim rugs to fashion an aisle for their 2016 wedding ceremony. When she offered her post-wedding spoils up to her 800 Instagram followers, they were snatched up instantly. 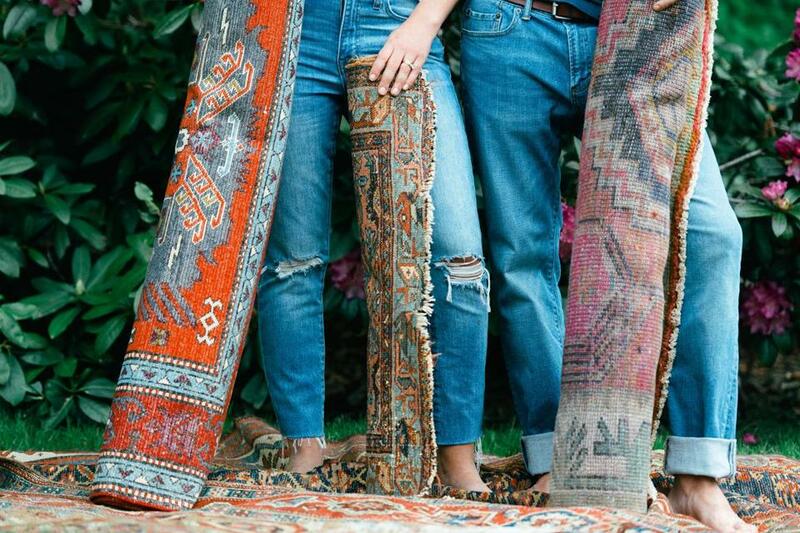 Today, Lindsey and Josh are known as @NewEnglandLoom, where more than 19,000 followers double-tap the dreamy interior photographs featuring the 20 to 30 rugs they sell each week. She is the creative director, while he oversees the logistics. Every Sunday, the rugs — styled, photographed, sourced, and later shipped by the couple from their Wenham home — are posted to their online store (newenglandloom.com) promptly at 8 p.m. And often, within an hour, each one-of-kind rug is gone. Shoppers also take to Instagram to share their emoji-filled delight or dismay (“So bummed! I had it in my cart then went to buy it yesterday and it was sold”), creating a vibrant and engaged community of interior lovers around the brand. While supply and demand plays a role in their retail strategy — both have day jobs in the Boston e-commerce world; she’s in marketing, he’s in sales — New England Loom’s flash sale release schedule is based on the couple’s ability to merchandise and source. They photograph in their home, which has “great natural light and wooden floors,” using an iPhone. The rugs, from merchants in Turkey to antique dealers on the side of Route 1, are stored in the couple’s garage. It’s a near-full-time, full-lifestyle commitment. “Our dining room table and sofa haven’t been in the rooms they’re supposed to be in a long time,” Josh said, laughing. Their hard work has paid off, it seems, as purchasers are eager to share their spoils. Kirby currently has five New England Loom finds in her 1,000-square-foot home, deemed @theCozyRanch on Instagram, in Newport, R.I.
Mark Jagel of South Glastonbury, Conn., learned about New England Loom from his daughter, who follows it on Instagram. Since then, he’s purchased four rugs — with the intention of expanding his collection. “I visited their house for my first purchase, met Lindsey and Josh, and liked them quite a bit and I feel they have a great business model,” said Jagel. To add to their charm, each rug gets named after a New England town or landmark. While the nods from influencers, clever copywriting, and an eye for what will sell have helped New England Loom grow the brand, the Grazianos jokingly insist it’s their Bernese Mountain Dog, Mowgli, who is the real deal closer. And before you ask: “We clean every one of them before they get sent out,” added Josh. 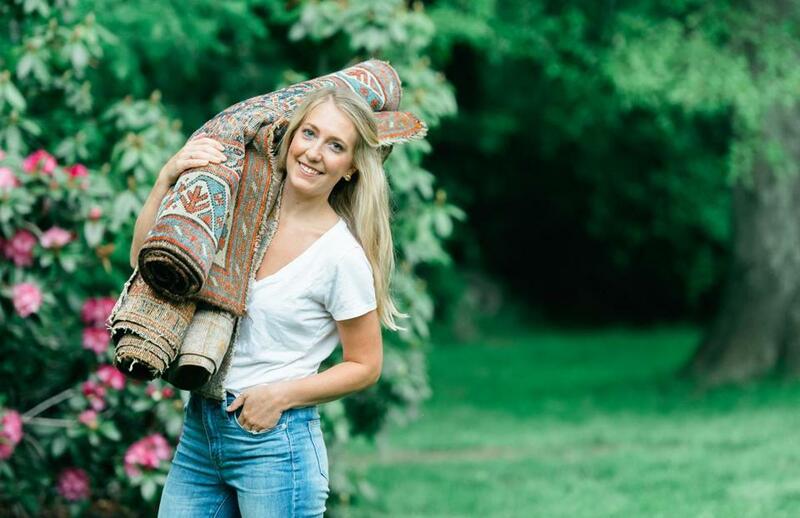 Lindsey Graziano first began collecting vintage rugs to fashion an aisle for her wedding ceremony.